A jewel in the freshwater community tanks, the swordtail brings an energetic aura into their aquarium. Their quick movements and ease of care make them easily one of the best freshwater community fish. 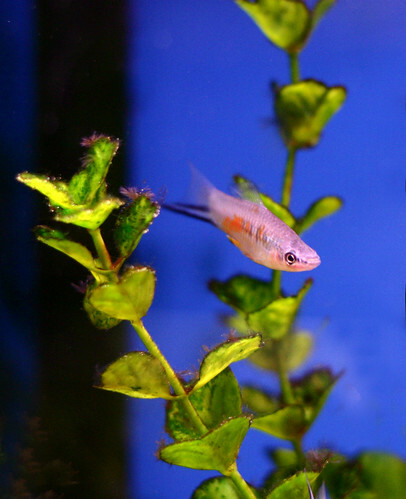 Keep reading for everything you need to know about swordtail care and keeping your swordtails happy and healthy! This swordtail caresheet is a guest post by Joshua from The Mandarin Garden. Thank you for this long and detailed article! The swordtail originally came from the Honduras and Central Mexico, living in highly planted areas with fast water movement. Swordtails prefer a water of anywhere between 72-82 degrees Fahrenheit and a pH between 7-8. These conditions are easily met without any water adjustments, making swordtails also one of the more affordable choices for starter fish. This is not to say swordtails have no requirements. They do need a tank of at least 30 gallons or a 20 gallon breeder tank. The focus here is the tank length, as swordtails need long stretches of water to swim through. Confining them into a smaller tank can result in high stress and territorial behavior that is not common for this peaceful fish. Due to the fast swimming nature of the swordtails, jumping is a frequent problem of inexperienced owners. Keep all aquarium tops under a tight cover to prevent carpet surfing fish! While not necessary, swordtails love tall, dense plants in the aquarium. This replicates their natural environment and will greatly reduce stress levels. Both real and plastic plants may be used, with live plants giving your tank the added benefit of increased water quality and oxidizing the water. Some of the best plants to choose are Scarlet Temple and Java Ferns. Keep in mind this fish will reach up to 6 inches in length, making it one of the larger live bearing community fish. Additionally the sword will live an average of 4 years. Plan ahead to accommodate for their growth along with other tank mates. For filtration, bigger is always better. Swordtails are one of the larger common freshwater fish and can surprise owners with the increase in bio load they produce. A strong hang on back or canister filter is often recommended as it takes minimal tank space while providing high amounts of filtration. Remember that while the filter does help remove waste from the tank, the addition of 4 or more swords at once will cause ammonia spikes. Provide your tank with adequate water changes to ensure your aquarium does not crash and stays balanced while the tank adjusts to it’s new members. The body of the swordtail is similar to the molly fish but with a uniform curve on both sides of it’s back. The swordtail is often available in red and orange colors, but has been bred into a large variety of colors. Some breeders even raise purple swordtails! As previously stated the swordtail will reach an average of 6 inches long at maximum size. Many new owners are mislead as pet stores will sell very young swords that are hardly an inch long, leading to overstocking, stress and eventually death as the fish become too big for their tank. The swordtail is a generally hardy fish that does well in many home aquariums. The main threat to these long tailed fish is fin rot, which is one of the more noticeable illnesses. This can be taken care of by keeping the water quality very high at all times. Swordtails have a huge advantage when it comes to picking tank mates. The peaceful nature the exhibit to other species allows the owner to introduce almost any other fish that can survive under the same water conditions without incident. These include neon/red eye tetras, cat fish, mollies and platies (as demonstrated in the video above). Exceptions that should be noted are fin nippers and predators. While the second is true of most peaceful fish, fin nipping is a much more common problem among swordtail owners in particular. Their long flowing tails make them easy targets for a passing fish. Combined with their lack of aggression, swordtails will often allow the fin nipping until they become stressed to the point of illness. Fin nippers to avoid are tiger barbs, multiple tetra breeds such as white spot, black widow, blue and serpae tetras, and Betta fish. Bettas will often confuse the swords long tail as another beta and quickly start fighting. When choosing your swordtails be sure you do not only select fish with the actual sword tail. 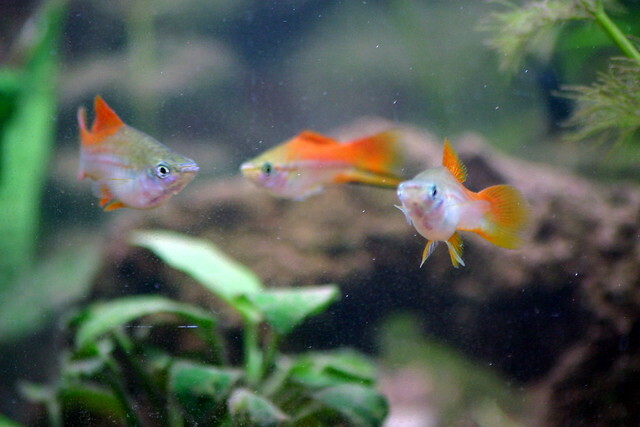 These are the male swordtails. While most community fish can be kept in larger schools, swordtails have an unusually high desire to express dominance to other male swords. To keep more than one male sword owners must often house at least 4 females per 1 male sword. These females will take most if not all of the males attention, removing their desire to fight the other males. For owners with tanks under 50 gallons I can only recommend you house one male sword. Most aquarists follow the rule of one inch of fish per gallon of water. With a max size of 6 inches and the need for 4 supplemental females, tanks would find themselves overstocked with 10 fish each of 6 inches in size. While tanks can have this many fish, owners will find increased aggression due to lack of territories as well as more the demand for more frequent water changes. Due to their hardy nature, swordtails will accept nearly any food you provide them. Feeding a large group of swordtails will often result in a real feeding frenzy, as can be seen in the video above. While swordtails have been noted to feed on invertebrates, insects and algae, prepared foods cover the same nutrition while being much easier to maintain. Their diet should consist of mostly high quality fish flakes, supplemented with vegetables such as zucchini or broccoli. 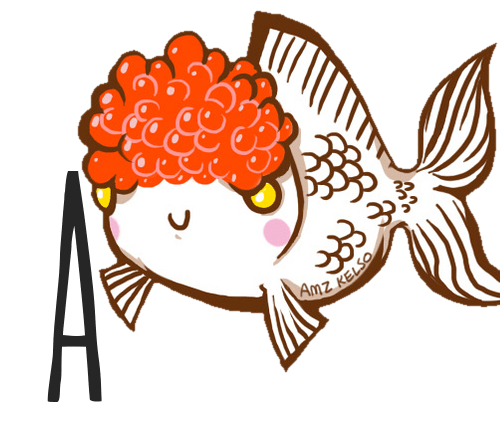 Be sure to blanch all vegetables and allow them to cool before feeding any fish. To entice swords further, boil the vegetables in dechlorinated water. Foods boiled in tap water are more likely to be refused. While only a few owners actively try to breed their fish, swordtails will almost always give birth in the new tank. As most stores will carry the swordtails all in one tank, it is highly unlikely that the females have not mated with one of the males. Simply owning both male and female swordtails is enough to produce new fry without any specific water parameters. Simply put, if you own swordtails you will have new fry. Swordtails are live bearing fish with quick signs of pregnancy. Once the female has become pregnant a dark spot will develop near the back fin and her belly will begin to swell. Care will need to be taken to ensure the fry survive. Many owners will place the female into a breeding net and remove her upon birth of the fry. This method will work and can save owners the hassle of setting up a new tank. The downside to this method is the stress caused by the breeding net on the pregnant fish. This can lead to early fish birth, or worse the loss of the parent. To avoid these risks a second tank will need to be set up. With the new fry born the parent must be removed and the fry are to be kept separate from any other adult fish. If the fry were born into the main tank large areas of dense brush can provide refuge to the fry. As the swordtail is a live bearing fish, the fry are born with large enough mouths to accept most commercially available foods. Live foods such as baby brine shrimp and micro worms make excellent foods as well. As the fry age, more and more males will develop their sword. Separate the obvious males, the ones with sword tails, from the rest of the fry. As more and more males are removed, the less dominant males will begin to grow their swords. After a week of no new swords it is safe to assume there are no more males left in the group. Once the swords hit 1.5 inches in length they are ready to be added to their new home. Remember to always add your new fish at night, giving them time to settle in before they are noticed by the other fish. Keep an eye on these new additions and watch as they join your now expanded community. If you have any more questions about keeping swordtails or want to share your own experiences with these colorful livebearers, don’t hesitate to leave a comment below. Happy fishkeeping!